Chinua Achebe is dead. Hearing the news of the death was a shock, yes he was old, but you still sometimes expect old lions to live forever. Chinua Achebe's different books, articles and essays he's written have had a significant influence on my own thoughts and views of the world. I find it instructive that he had a great belief in the power of the word and of writers to affect their society. He was an outspoken critic of the Nigerian government, even after the switch to democracy. Chinua Achebe publicly rejected National Honors and Awards bestowed on him. His final book, There Was A Country, published last year, shared his unvarnished thoughts on the main actors of the Nigerian civil war. Chinua Achebe may be dead now, but he has certainly laid down an enduring legacy. May his soul rest in peace and may his family be comforted. On behalf of our Chairperson, Board of Trustees and staff of the Nelson Mandela Centre of Memory, we would like to offer our condolences to the family of Prof. Chinua Achebe, a great African writer and thinker, who passed away on 21 March 2013 at the age of 82. Nelson Mandela referred to Prof. Achebe as a writer “in whose company the prison walls fell down”. 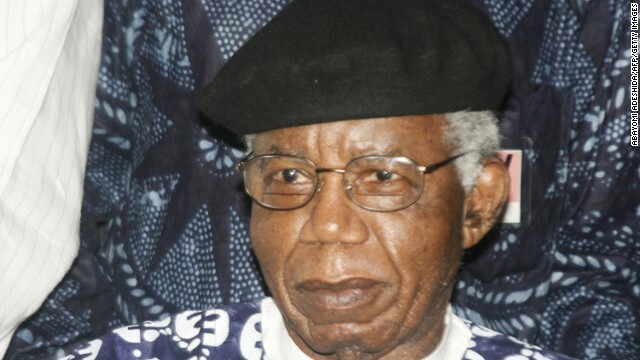 Forced abroad by Nigeria’s bloody civil war in the 1960s and then by military dictatorship in the 1980s and 1990s, Mr. Achebe had lived for many years in the United States, where he was a university professor. But he continued to believe that writers and storytellers ultimately held more power than army strongmen. If you don't like someone's story, you write your own. "There is no moral obligation to write in a particular way. But there is a moral obligation, I think, not to ally oneself with power against the powerless." "The sun will shine on those who stand before it shines on those who kneel under them." "We shall all live. We pray for life, children, a good harvest and happiness. You will have what is good for you and I will have what is good for me. Let the kite perch and let the egret perch too. If one says no to the other, let his wing break." "As a man danced so the drums were beaten for him." "The white man is very clever. He came quietly with his religion. We were amused at his foolishness and allowed him to stay. Now he has won our brothers, and our clan can no longer act like one. He has put a knife on the things that held us together and we have fallen apart." "Whenever you see a toad jumping in broad daylight, then know that something is after its life." "A proud heart can survive general failure because such a failure does not prick its pride. It is more difficult and more bitter when a man fails alone." There is that great proverb—that until the lions have their own historians, the history of the hunt will always glorify the hunter... Once I realized that, I had to be a writer. "Every generation must recognize and embrace the task it is peculiarly designed by history and by providence to perform." "We must hear all the stories... And by hearing all the stories, we will find points of contact and communication, and the world story, the Great Story, will have a chance to develop." "If one finger brings oil it soils the others." "I worry when somebody from one particular tradition stands up and says, "The novel is dead, the story is dead." I find this to be unfair, to put it mildly. You told your own story, and now you're announcing the novel is dead. Well, I haven't told mine yet. " "The world is like a Mask dancing. If you want to see it well, you do not stand in one place." A good writer doesn’t really need to be told anything except to keep at it. Just think of the work you’ve set yourself to do, and do it as well as you can.